I also play recorder (not harmonica!) 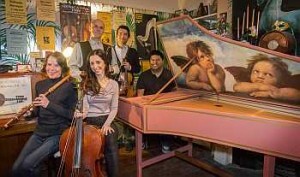 in a 5 piece baroque band, called Balmain Baroque. The lineup is Amanda Muir – baroque flute and soprano vocal, Lauren Salanitro – cello, Kahne Raja – violin, Donn Mendoza – harpsichord and me on recorder. We do around 3 recitals every year, each one involves around 6 weeks of rehearsal. We play mostly early 18th century music, and play at baroque pitch, which is a semitone lower than modern pitch. The music actually sounds better at this pitch, and it is also much easier for the singers! I have a beautiful 415 Alto recorder, made by David Coomber in New Zealand. 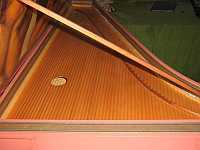 We have a harpsichord, as shown in the photos. The instrument sort of a cross between a piano and a guitar, as the strings are plucked each time a key is pressed. The harmonica and recorder are obviously very different. The recorder does not have a large dynamic range (it goes sharp if you blow harder). Recorder dynamics are instead achieved by variations in articulation. I’ve applied this technique to my harmonica music, listen to my recordings to see what I mean by this.